If you're tired of skiing on Earth, there's some perfect powder waiting for you, just 800 billion miles away. 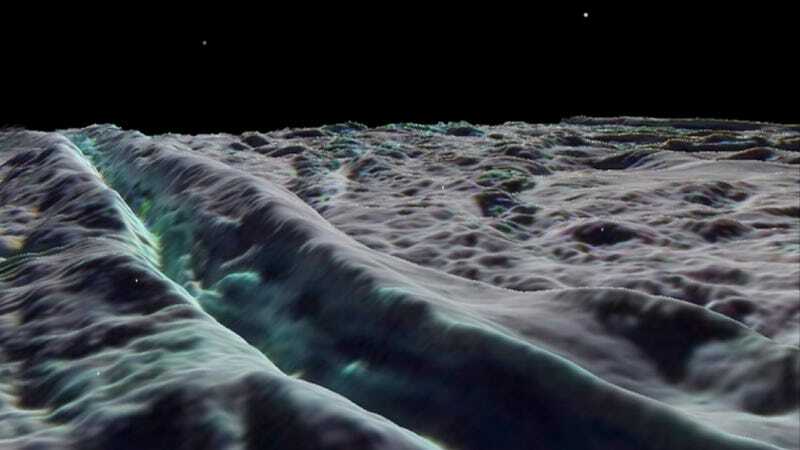 It's all thanks to Enceladus's amazing water geysers, some of which rain back down on the moon's surface as snow. We've known for some time now that there are geysers on Enceladus, but it's only in the last year or so that the Cassini spacecraft has been able to fully reveal how remarkable these eruptions are. We recently discovered those geysers shoot water all the way to Saturn itself, making Enceladus the only known moon to affect its planet's climate directly. And now we've discovered how those geysers are affecting conditions back on Enceladus... and, well, it's pretty much the perfect off-world ski resort. Via ScienceNOW. Image by Europlanet Outreach/Lunar and Planetary Institute.